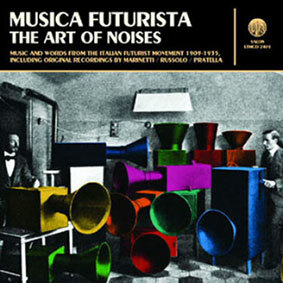 Musica Futurista is a comprehensive collection of music and spoken word from the Italian Futurist movement 1909-1935, including original recordings made by Filipo Tomasso Marinetti and Luigi Russolo. As well as vintage free-verse readings by Futurist founder Marinetti, this popular primer includes recordings of the celebrated intonarumori (noise intoners) devised by Russolo, including a fragment from his lost landmark work The Awakening of a City. As well as restored archive recordings, the album include recent performances of key Futurist musical works by Balilla Pratella, Luigi Grandi, Silvio Mix, Aldo Giuntini, Franco Casavola and Alfredo Casella by leading contemporary interpreter Daniele Lombardi.